We are a renowned Mixture gas manufacturer, supplier and exporters in India. Mixture Gas is a mixture of usually two, and some times more gases blended together in percentage concentration and to be used for any particular industrial or medical application. Major component of mixture gas is mostly an Inert or Noble gas. Now a days due to advancement of technology, various gas mixtures are getting used in various applications for enhancement of quality as well as to reduce price. Some of the commonly used gas mixtures are Argon + CO2 gas mixture, used in MIG welding, Argon + Hydrogen Gas mixture used in TIG welding. Argon mixed with Neon or Krypton or Xenon is used in lighting industry. Other mixtures being used extensively in industry are Nitrogen + Hydrogen, Helium + Nitrogen Etc. Mixture Gas can be made available in carbon alloy steel cylinders or Aluminum cylinders. 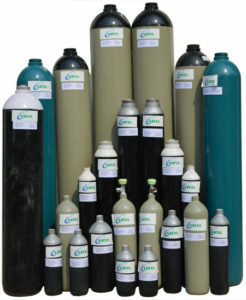 The selection of cylinder material depends upon the chemical nature of mixture gas to be store in it. 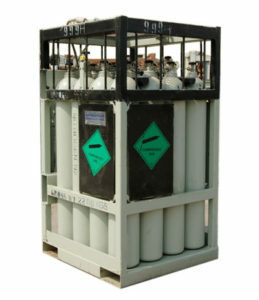 For some applications where continuous and high quantity of Argon gas is required to be feed, We make use of Argon gas cylinder quad which is nothing but number of cylinder interconnected and having common outlet and common inlet. In short, a bunch of many cylinders can be used, loaded / unloaded as single unit. These mixtures are produced using highly accurate analytical pressure gauges as well as using highly accurate weighing scales. Axcel Gases provides various types of gas mixtures at very competitive price and with high accuracy. These mixtures are well within the specified blend tolerance level. The Gas mixtures are prepared through volumetric method using highly accurate analytical pressure gauges. We have fully equipped laboratory consisting of highly accurate weighing scale, analytical pressure gauges, various gas analyzers and gas Chromatograph to blend and check the concentration of various components of gas mixture. Gas mixtures can be made available in thousands of combination depending upon gas component to be blend together and their respective concentration. At the same time blending of gas component is restricted by their respective re-activity with each other as some gases are not compatible. Also some gases are not compatible to certain cylinder or valve material. In various welding techniques adopted. In light / bulbs manufacturing industry. In leak testing of various vessels. These are some of the common uses of Mixture gases . There are various other ways in which Mixture gases can be used in a particular industry or process.